This Friday night, April 19th, DJ Roger Holcomb will be spinning the tunes for our pre SOS party. We will serve sandwiches and snacks free for our members and $5 for guests and non-members. Hope to see you all there. C'moan baby 'n' let the good times roll. Well maybe not all night long, but 11:00pm would be good. Our Golf Tournament flyer and registration forms are posted on the Flyers Page. we are actively looking for sponsors. If you, or anyone you know, would like to sponsor a hole for the tournament the cost is $100. Please contact any of our officers at their emails listed beneath each picture to the left. We encourage all members to click on the Bylaws link above as well as the Our History page. 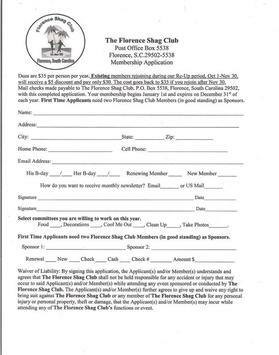 The Florence Shag Club was Established in 1985. Shagging is not only a dance, it's a mindset and a lifestyle. The purpose of the Florence Shag Club shall be to preserve, encourage and promote the education and perpetuation of the Shag, to provide social activities at which emphasis is placed on the dance, and to inform its members of beach music and Shag dancing activities. May Florence Shag Club forever be a part of our lives as we keep on Shagging! The time to join the FSC, for the new 2019 year, starts on October 1st, 2018. Starting December 1st the dues will be $35 for existing members as well as all new members. DJ Roger Holcomb will be spinning the tunes at the Circle Fountain this Friday night, April 19th for our pre SOS party. Get there early, grab a beverage of your choice and let the good times roll. FSC Golf Tournament Hole Sponsors form.